Actually, there are two of volunteers. They're growing under and next to our compost tumbler. 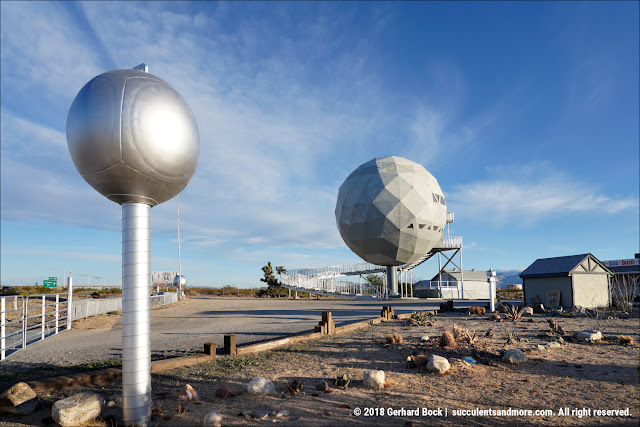 It sat there for several years, with some compacted, dehydrated and semi-composted plant matter inside. The tumbler—or rather the composting process—never really worked the way we had thought, probably because we didn't put enough effort into doing it right. A few months ago I decided to open the tumbler and spray the "compost" with water in an attempt to rehydrate it for possible use in the garden. And promptly forgot about it. So that's the backstory. But I still didn't know what these mystery plants were. 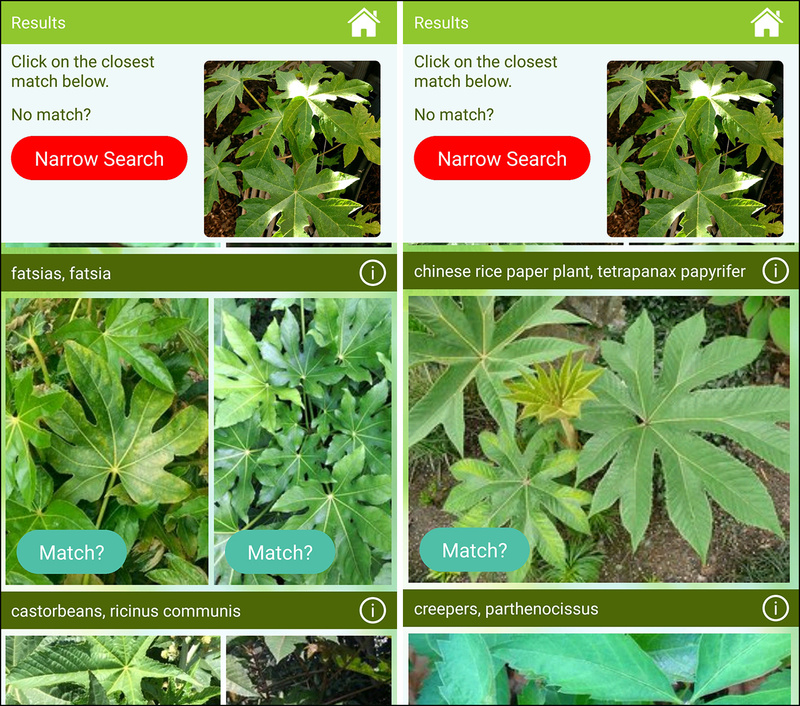 I decided to try a couple of plant identification apps I had recently installed on my phone. These apps take a picture of the plant in question and try to match it against their online database. 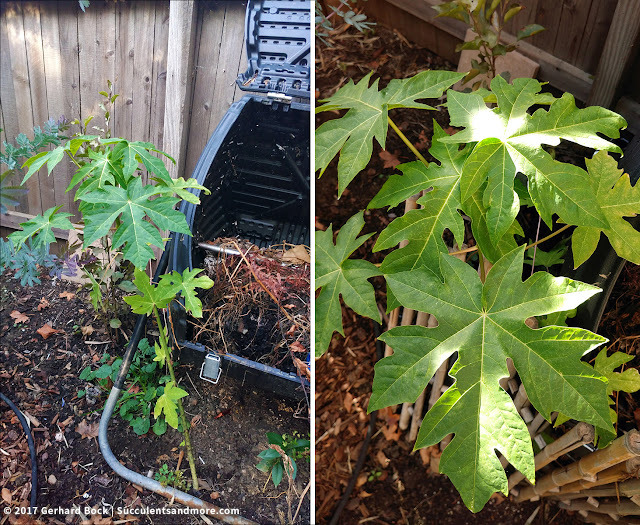 Hmmm, good try but no go although castor bean looked to be the closest in terms of leaf shape. I repeated the same exercise in an app called Garden Answers. 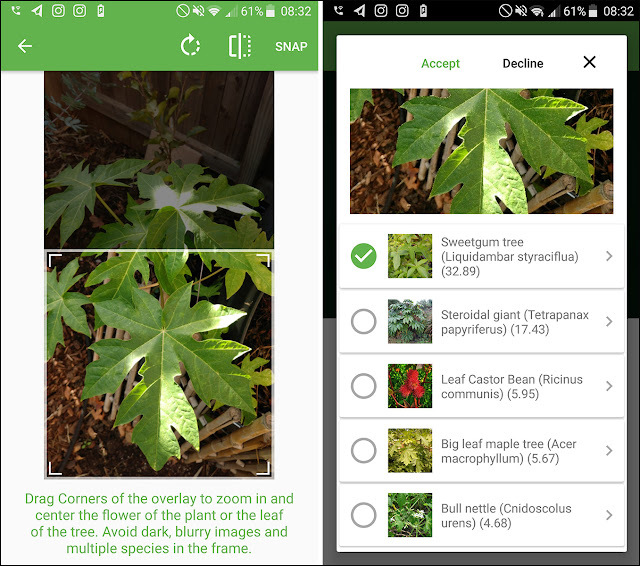 Like Plantsnap, it suggested castor bean and tetrapanax (as if!) as well as things like fatsia, Japanese maple and fig. No match. After some deep thinking (a nap was involved) I decided to post a photo to the Plant Identification group on Facebook. Membership is open to anybody, and with over 133,000 members around the world, there's a vast pool of knowledge to be tapped into. Within minutes (literally! ), I had the answer: Carica papaya. 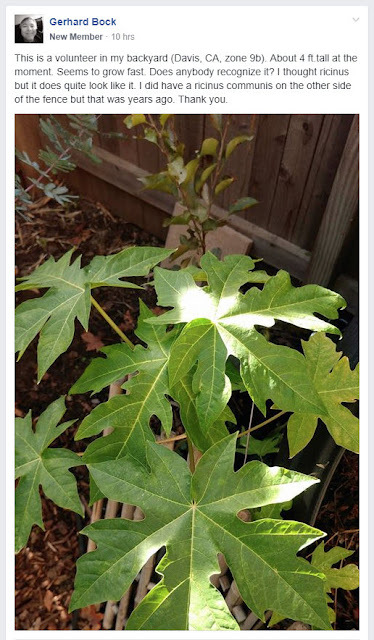 I had a hard time believing it at first, but looking at photos of papaya leaves on Google Images confirmed the ID. But where did the seeds for these papayas came from? My best guess is that they must have been in the old compost in the tumbler. Either they fell out when I was messing with it, or—more likely—rats dragged some of the compost out of the tumblr, and the papaya seeds along with it. 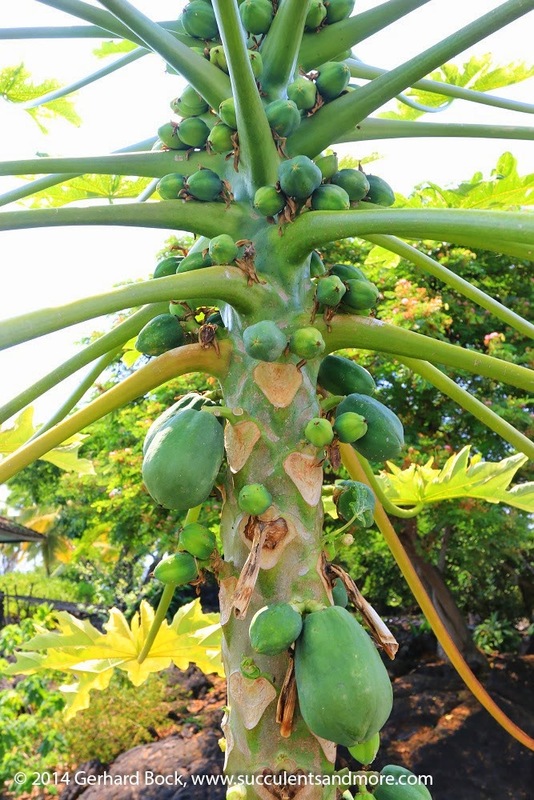 Unfortunately, papayas are tropical and can't take any frost. Unless we have an exceptionally mild winter, our two volunteers probably won't be around in a few months. For now I'm leaving them to see what happens. 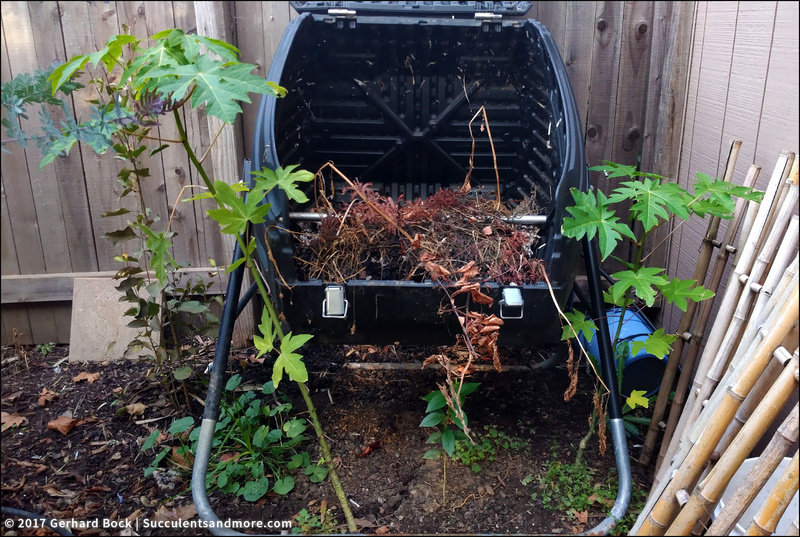 The compost tumbler will be Freecyled (our kitchen scraps go into our city-provided green bin) and I will finally be able to plant the Calistemon 'Slim' I bought at the first UC Davis Arboretum plant sale in early October. 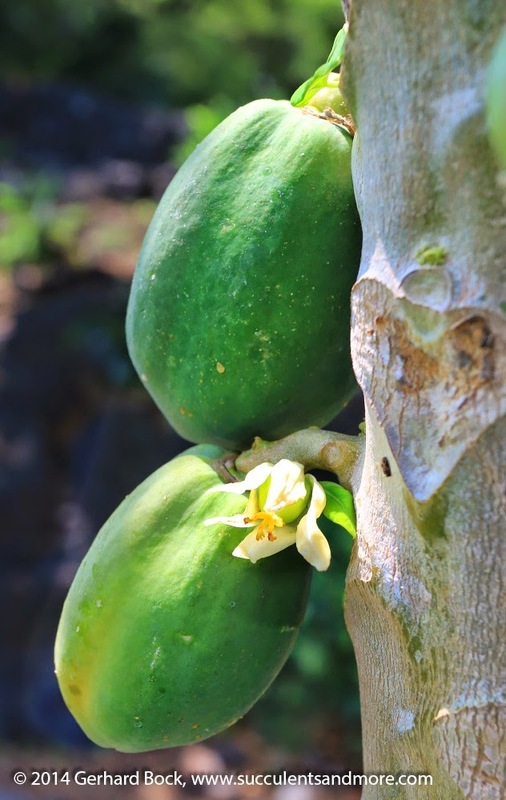 In my quick research, I learned that, technically speaking, the papaya is an herbaceous plant, not a tree, because it never forms real wood. 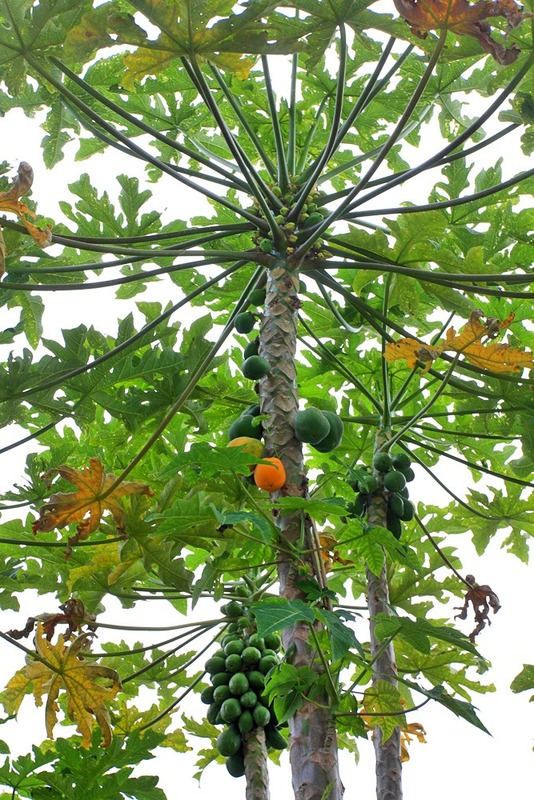 Carica papaya is native to Mexico and Central America. 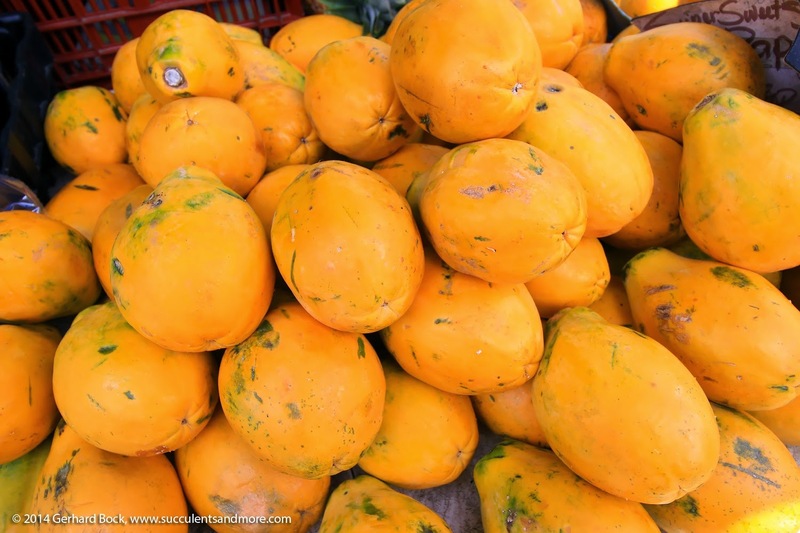 Called "fruit of the angels" by Christopher Columbus, it's one of the healthiest fruits in the world. That was an interesting exercise. And it's nice to know that there are still tasks that humans perform better than computers! Yeah, I was glad I could ifnally try out those apps. 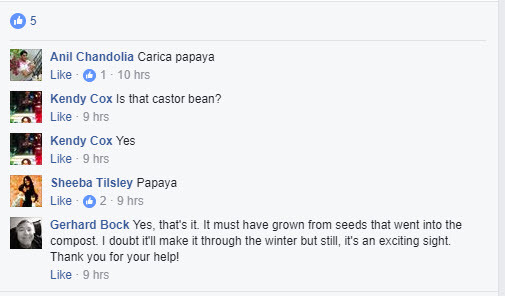 That plant ID group on Facebook is a really good resource. I saw this briefly pop in my FB feed and was rather upset when my laptop chose that movement to lose the WiFi connection and I never found that thread again. Thanks for posting photos and the answer here....and fingers crossed for a mild winter so they can explode in 2018. FB is awful that way. I often see things I'd like to go back to later and I never find them again. I knew that one right away, because there are several growing and producing plentiful fruit in the neighborhood. Reflected heat from surrounding masonry is ideal. One instance where Facebook is worth something. Wow, I had no idea they grow in Southern California. What about mangos? The plant groups on Facebook are often very useful as long as you ignore the occasional bickering. Good luck with your pawpaw (as we say here in sunny Queensland). I'm not sure how long your winters are, or how frosty, but a warm, sheltered position should see your little tree right. Even if your fruit are only small and don't ripen on the tree, they are still delicious and healthy to eat when green. If gardeners can grow mango and avocado in Melbourne, albeit with a longer time to fruit, and a smaller crop yield, who says it is not possible. But, a blanket to protect from frost would be a good idea. 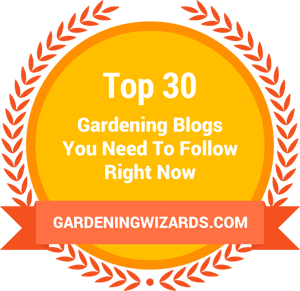 Good luck and enjoy, after all, there's not much more fun in gardening then growing something well where it is not supposed to. 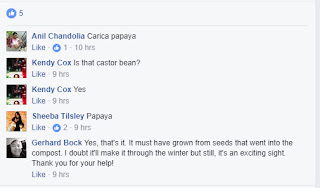 I instantly recognised it as Carica papaya and glad to see that FB agrees! Lovely plant and fortunately it gets warm enough there to put on a decent growth and treat as an annual.